In this scenario, a company transitions all of the mainframe hardware, tape and storage to a vendor’s data center. A vendor then manages the mainframe systems. A mainframe outsourcing vendor provides IBM software and can provide some third-party software products (such as Computer Associates).This scenario generally produces the greatest financial benefit. However, there is some inherent risk in migrating a client’s mainframe environment into a vendor’s datacenter. This risk is fairly low as it is comparable to a disaster recovery test. Through economies of scale, a vendor can provide savings to their clients by enabling them to leverage their facilities, staff, hardware, and software licenses. In this solution, a vendor will support the mainframe environment at the client’s site. This could include having a vendor hire or “rebadge” most of the client’s staff that is supporting the mainframe. The vendor may acquire the customer’s hardware and provide software licenses. This scenario provides a low transitional risk, because a client’s mainframe equipment remains in place, but the financial gains are typically not as large as the traditional outsourcing model. In this model, a vendor provides various technical and operational services remotely (off-site) while the client retains responsibility for the hardware and software environments. This scenario provides the least amount of cost savings but can be implemented the quickest and is a low risk solution. Remote management is a good solution for companies that are averse to outsourcing; it allows them to quickly add a greater depth of staffing and support. Remote management is sometimes a first step for companies that don’t have a great deal of experience with mainframe outsourcing. A vendor would provide the mainframe hardware to maintain the client’s processing. This includes CPU, Tape and Storage. Monitor the System: Maintain and report on Service Level Agreements. Store and Rotate Tapes: Provide offsite storage and rotation system. CICS/IMS: Supporting all online system regions. OS Upgrades: Installing new releases/fixes to operating system (IBM) software. Capacity Planning: Performing capacity planning that is necessary for storage and CPU utilization. Disk Administration: Monitoring and reporting on volume space usage and availability. Performing full volume restores if required. Moving files if more space is required on a volume. A vendor would provide automated scheduling of batch cycles and job restarts/reruns on the mainframe. They would manage the movement of code changes between test and production environments. A vendor would perform system related functions (physical) for database systems (e.g., DB2, etc.). A vendor would implement and maintain an organization’s security policy on the mainframe. A vendor would support all ISV software that a client is licensed for and/or uses. They might also provide certain software products that they have access to. See our mainframe hosting software page for information on how outsourcing vendors are able to provide third party software products. A vendor would provide and support all IBM software that a client is licensed for and/or uses. A vendor would manage and monitor connectivity of network communication to the client’s site. A vendor would provide mainframe disaster recovery support and testing for the mainframe. If you are considering mainframe outsourcing then you might be interested in our Rapid Outsourcing Calculator™. 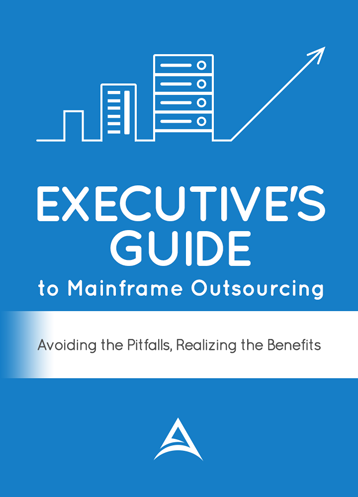 This will provide you with a cost estimate for outsourcing your mainframe.